One of your favorite healthy dips turns into a cool and delicious soup with this easy recipe for chilled hummus soup. Good and good for you! Hummus! It’s one of my favorite things to make (especially with my fool-proof five minute food processor recipe), and I like eating it even better. Creamy, slightly spicy, pretty healthy, totally delicious hummus. 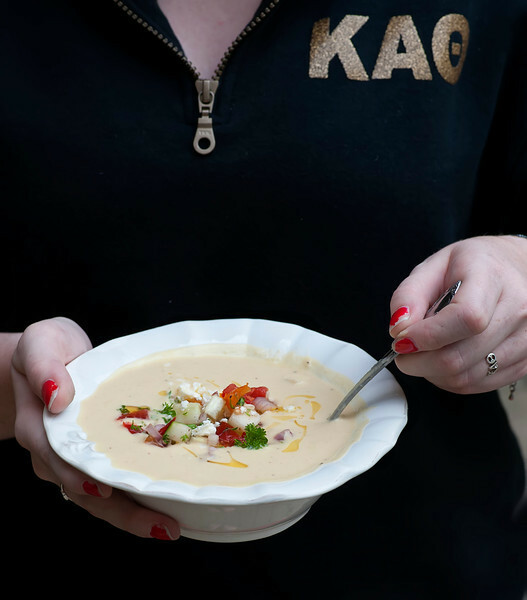 And so those of you who know me well know that I have this obsessive habit of turning my favorites into different formats will not be surprised that I turned my favorite dip into a soup. 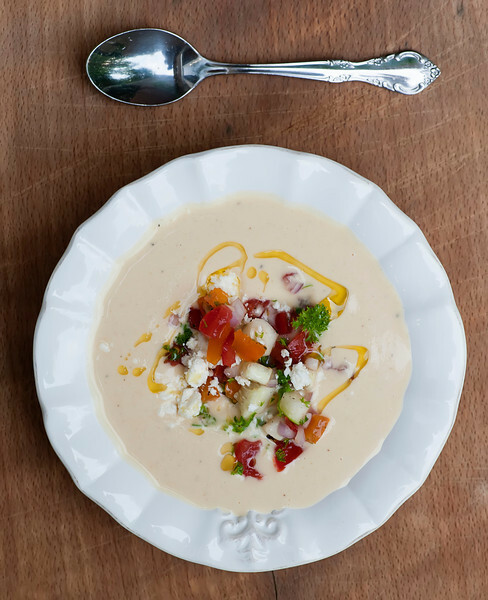 A quick, cool, just right for the end of these warm summer nights soup. Side note: I recently got a remote for my camera, and for some reason this inspired me to start taking pictures of myself and other people holding plates of food. Below is a picture of the Southern daughter holding a bowl of the hummus soup, which she would never eat in one million years. Doesn’t like soup, doesn’t like hummus. If it wasn’t for that whole 20 hours of labor thing, I would question whether we are actually related. However, it does mean more chilled hummus soup for ME. Anyway. I started this out the same way I make my regular hummus, in the trusty food processor. Rinse off some canned chickpeas (I like the Goya variety best) and drop them in the processor with some lemon juice, olive oil, garlic, tahini and cumin. Whirl it all up, and then add about 2 cups of cold water. Now pour the whole thing through a fine mesh strainer and stir it around until the liquid strains through and the solids are left behind. Taste it and add salt and pepper as needed. At this point you can chill it down a little more or you can eat it right then and there at room temperature – either way is fine! And while this is delightful as is, or with a swirl of olive oil, if you want to go all the way to chilled hummus soup heaven you can make a quick garnish of chopped tomato, shallot, cucumber, parsley and feta. Spoon some on top, and do feel free to also add that swirl of olive oil anyway. My final comment on all this is that one day I am going to bring this all full circle and serve up this soup in shooter glasses as, yep, an appetizer. One day soon! Put chick peas, cumon, garlic, tahini, lemon juice and olive oil into a food processor and process until smooth. Pour water in through the feeding tube and process again. Place a fine mesh strainer over a bowl and pour the soup through the strainer into the bowl. Stir the strainer contents to help separate the liquids from the solids. Season to taste with salt and pepper. At this point you can eat it as is, or chill it further in the fridge. To make the garnish, combine all the garnish ingredients in a small bowl and stir gently. Spoon onto the top of the soup and swirl a little olive oil on top. This soup is genius! We eat hummus very regularly in our home…there’s always some in the fridge. I’d love to try this! So nice to have found your blog! Hummus as soup sounds good to me! I could pretty much eat it for dinner every night and be content! Loved this recipe, it went into our “Hall of fame” recipes that we are happy to share with visitors. Good job Kate :-).